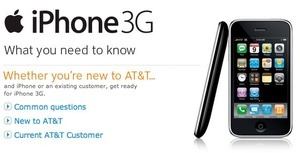 AT&T says that its rollout of a speedier 3G mobile network is nearing completion in the U.S.
AT&T says all it needs to do is add six more markets by the end of June and deployment of High Speed Uplink Packet Access technology — faster access to data networks for mobile phones, for those who could care less about tech speak — will reach more than 280 markets. So? Will you get 3G speeds where you live or work? A few miles away from me, in Southlake, Texas, there’s an Apple Store where bunches of people will wait in line, probably in near 100 degree heat, to secure the highly anticipated iPhone 2.0. If they live in the affluent Dallas and Fort Worth suburbs of Southlake or Colleyville or the more modest ‘burbs of Grapevine, Keller, the Mid Cities, Justin, Lewisville — the list goes on — the new iPhone may not receive 3G coverage. And this is according to AT&T’s own coverage viewer list, which you can review here. Click on a neighboring city and drill down by zip code, and AT&T’s coverage viewer shows 3G is in every nook and cranny whether a specific city or suburb is listed or not.